The award-winning designer Grandstream has continued its trend of providing the customers with high-quality audio communication products by launching its new model GXP2140 into the market. With an amazing user interface and advanced updated features, GXP2140 tends to become the most effective enterprise phone that can prove to be the most suitable one to solve the communication problems and keeping all the staff in contact offering a flawless communication channel. Grandstream Launches another model GXP2140 in the series. Similar in features to other Grandstream phones. Grandstream GXP2140 is a 4- line VOIP phone and is equipped with a lot of advanced features and functionalities. It is available in black color, and the user can have a clear view because of the TFT 4.3 inches LCD graphical display having a marvelous resolution of 480 x 272 pixels. It has total up to 5 soft keys that are programmable and context sensitive present near the screen. It has Bluetooth V2.1 feature that allows the transfer of information wirelessly. It helps to connect with even other mobile phones to transfer contact lists or calls. It also incorporates a USB port to transfer files. Grandstream GXP2140 can manage up to 4 SIP accounts. It has an additional advantage that is compatible with Grandstream GXP2200 LCD module. It has an amazing speed of about 8 BLF / Speed dial keys which allows you to check the status of transfer calls. This makes it an effective phone to be used in business, enterprises and SMB’s as it has amazing speed, performance and voice quality. Grandstream is known for its next generation audio and video products, and this is the reason for its popularity in Dubai. There are a lot of resellers of Grandstream in Dubai that offer you Grandstream GXP2140 Dubai and many other phones and accessories of Grandstream. You can get your required Grandstream products easily by visiting any nearby marketplace or store offering you Grandstream products. But, you must make sure one thing that the reseller from whom you are buying your product is an authorized reseller of Grandstream. There are a lot of resellers in different areas of U.A.E, Sharjah, Dubai, Al Ain, Ajman, Ras Al Khaimah and many other areas from which you can get your desired Grandstream product. Grandstream has added some additional features in GXP2140 like five-way conferencing feature, and it’s just like a virtual conference with others employees and businesspeople. In this way, it saves you a lot of time and offers a convenient communication channel. It has encryption security for safety and security; the user can have password protection so no one can misuse it as it is a high-quality professional phone. It has up to 11 keys particularly for functions like displaying message, a phonebook key, key for transferring calls, for 5 way conference, holding the call, headset connection, mute, send or redial option, speaker phone and 2 function keys for increasing or decreasing volume. An updated storage capacity in the phonebook and call record. You can store 1000 contacts and keep the record of almost 500 calls in the call log. And many others features. It is a desktop phone, so it has a base stand. Moreover, it has a wall-mountable stand also. Some languages are available for ease of use that can be selected for example English, Italian, Chinese, Arabic, Japanese, Spanish and 13 other languages. Due to internet connection updates in firmware are available and should be updated time to time. While buying this handset, base stand, universal power supply, Ethernet cable and quick user guide is provided in the package. Grandstream is known for providing high-quality audio features, and same goes with its model GXP2140. It has an amazing voice quality offering an HD audio feature on both handsets as well as the speakerphone. It has dual switching Gigabits ports and an integrated PoE feature. It has electronic hook switch. It can connect up to 4 extension modules. It has google voice application that allows to call contacts just by calling their name in the contact list. This IP phone is connected to the web that’s why a user can take advantage from its web applications for example RSS news or weather situation. It has internet radio facility, and GMI is also available. With all these features, it is still very cost effective and appropriate for a user. 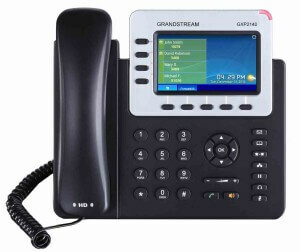 There is no doubt on quality and user friendliness of Grandstream GXP2140 IP Phone. Mostly, users have provided positive feedback for GXP2140 that give you a good idea about the quality and reliability of the product.There are a lot of GXP2140 users in different areas of U.A.E. The positive feedback will surely help in making a decision buying this phone. Overall as far as the features are concerned, the phone seems to be a pretty good package!.Grandstream Dubai is always committed to provide you high quality IP Telephones.